No one should see this. : Casual Cosplay! So, I think I've mentioned that I love cosplay, but I'm not a convention goer, so super fancy outfits are kinda a waste on me. However, cute casual clothes are perfectly acceptable. I'm sure you've noticed. Almost every bit of clothing I've made has been an outfit of some character. 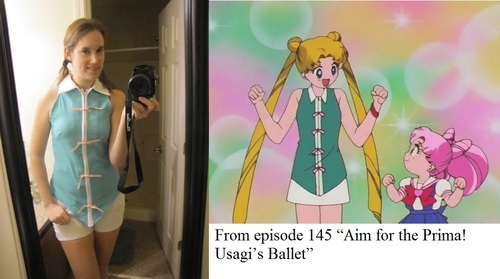 So Sailor Moon is actually great for that because the girls spend a lot of time in normal clothes. That's not always a guarentee of something wearable, the fashion sense in the anime is really horrific sometimes, but sometimes it's really cute. So here's my Usagi outfit. I went for pigtails just for fun, but I don't think I'd actually wear my hair like that. Also, I don't have a shot of what shoes she's wearing so it's not quite complete. Regradless, I'm pretty happy with it.